One of the most prestigious prep schools in the country...But behind it's hallowed doors something sinister and deadly lurks. When six brilliant but troubled new students arrive, they find themselves trapped and desperately seeking answers...and escape from a place where nothing is what it seems to be! This novel had beautiful art throughout. It's definitely a "prettier" style than the artwork inChew. 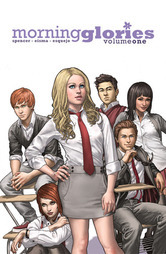 I really enjoyed Morning Glories despite the lack of answers. I think I shall keep reading.